Data is at the heart of conversational AI. It’s used to enrich the conversation, improve the system and deliver actionable insight to the business. 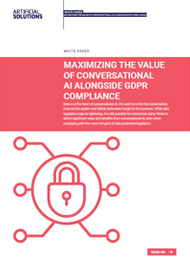 While data regulation may be tightening, it is still possible for enterprises using Teneo to derive significant value and benefits from conversational AI, even when complying with the most stringent of data protection legislation.